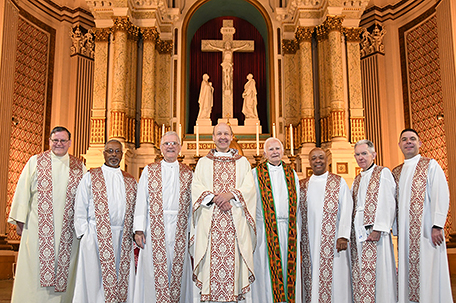 On Saturday, October 27, a celebratory Mass was held in the Church of the Gesu to commemorate Gesu School’s 25th anniversary as an independent Catholic school and its positive impact on the community since 1873. 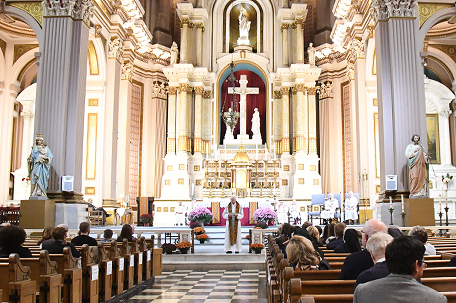 This special occasion recognizes the vital role that the church has played in Gesu School’s history as a former parish school and its ongoing importance to the school today. Fr. Raymond Donaldson, S.J., Gesu school chaplain, was the Celebrant, along with Principal Celebrants Fr. George W. Bur, S.J., Gesu School founding president, and Fr. Neil Ver’Schneider, S.J., Gesu School vice principal and chaplain, along with other concelebrants from the Gesu community. At the 25th Anniversary Celebratory Mass, the Gesu Gospel Choir inspires the community with their joyful voices. The offertory included a procession with two original faculty members and Sisters, Servants of the Immaculate Heart of Mary, who codirect Gesu School with the Jesuits. The Gesu Gospel Choir provided inspiring music and set a joyful tone for the celebration. Gesu School Chaplain Fr. Neil Ver’Schneider, S.J. delivers the homily at the 25th Anniversary Celebratory Mass, and reflects on the community’s role in keeping Gesu School open as an independent Catholic school, after the parish closed in 1993. 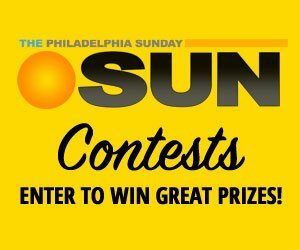 The Gesu parish had been a cornerstone of the Philadelphia community since the late 1800s. At its peak, the Church of the Gesu was home to 20,000 parishioners living in North Philadelphia. Over several decades, the city experienced significant financial hardship and urban deterioration. By the late 1980s, the Gesu parish was struggling to support itself and was ultimately forced to close its doors in 1993. At the time of the parish closing, the Archdiocese of Philadelphia gave approval for the Jesuits and the IHM sisters to keep Gesu School open, not as a parish-supported institution, but as an independent Catholic school. 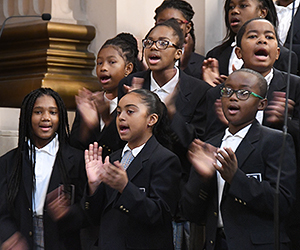 Gesu became Philadelphia’s first Catholic school of its kind, blazing the way for the Catholic mission schools that would follow 20 years later. Concelebrants gather in prayer and celebration at Gesu School’s 25th Anniversary Mass in the Church of the Gesu. Gesu School is codirected by the Sisters, Servants of the Immaculate Heart of Mary and the Jesuits. 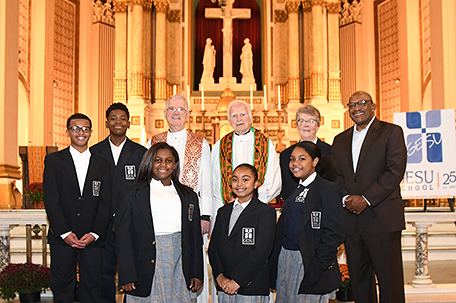 Thanks to the efforts and the contributions of many hard-working leaders, educators, board members, and volunteers, Gesu School has not only survived — it has succeeded in becoming a national model for inner-city education. Today, Gesu is proud to celebrate its 25th Anniversary as an independent Catholic School serving 450 children from Pre-K through 8th grade.